“Now, every time you come into this building, you will see it and remember that this building is in memory of someone who thought of others. And as you remember this, you must remember that you are having the opportunity of learning to think, because there was someone who didn’t think only of herself all the time, but who thought of making her life count for somebody else too. House prayer services have been encouraged; church and Sunday School attendance have been required. Visiting preachers have come often and the visits of Dr. Roberts, the Methodist minister from Harlan, monthly in 1922-23, of his predecessor, who came several times, and of Mr. Zeigler of Berea, who for the last five years has come annually for a series of services and informal meetings with the children, have been very effective. But the steady, day-by-day influence of workers brought up to other ways of Christian living, and the ideals of the school slowly permeating the children’s lives have been the most effective influence. We remember notably beautiful services: – the third Thanksgiving, when the School family, numbering thirty-five then, spent the day at Jack’s Gap, and the service consisted of the reading of St. Francis’ Canticle of the Sun ; Easter and Christmas services beautifully simple, the dedications of the two schoolhouses and of the Chapel. The Chapel made more regular our vesper services, when Mrs. Ethel de Long Zande‘s talks, full of the clear light of her searching thought, vivid illustration and warm and living Christianity, were vitally related to the children’s lives. The children have never been encouraged to think that the verbal profession of Christ was important at this stage of their lives; rather we have been confident that the seeds should be laid and left to germinate; that permanent good developed slowly. It has often been difficult for us to persuade visiting preachers that what seemed to them a golden opportunity to urge a promising group of young people to make a public confession should not be seized. Once or twice, however, there have been baptizings here. 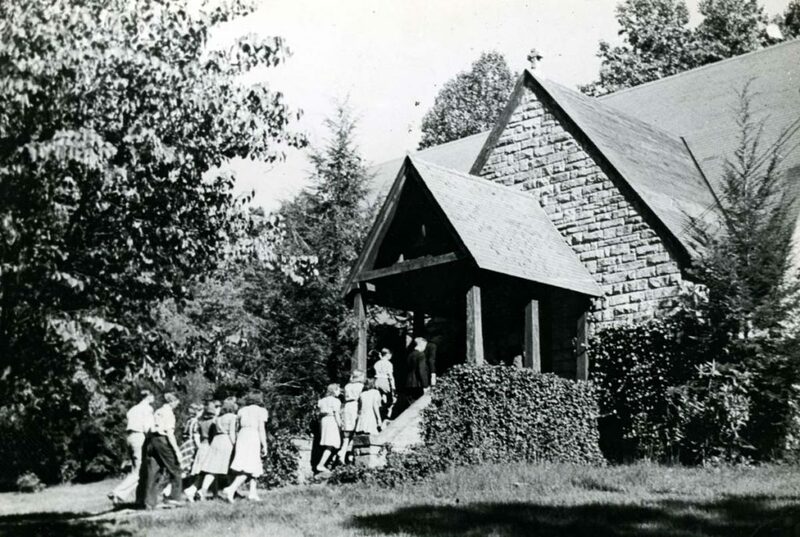 In April 1922 twenty-one boys and girls were baptized into “the church universal,” mature young people who, when the chance came to them, would enroll in the church of their choice. In 1924 the double wedding of Allene Nolan to Dillard Metcalf and Hazel Nolan to Pearl Shell took place in the Chapel. Mr. Fields of Big Laurel married them, and the Laurel House girls were the “waiters.” A wedding more sophisticated in character was that of Louise Will and Will Browning, that same spring. The dignity of all our chapel services, their restraint and order and sincerity has had its own lesson for children of this country where church-meeting has been social rather than uplifting. EVELYN K. WELLS PMSS Harvard University talk, on Folk Music. July 21, 1955.